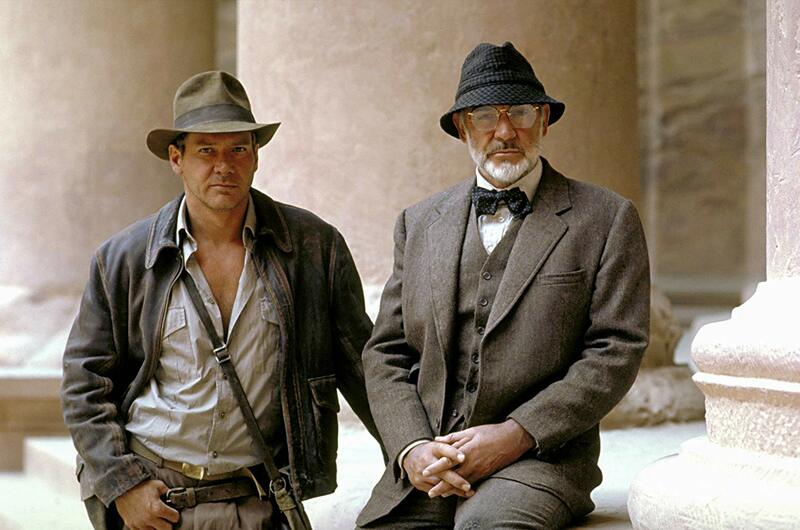 Indiana Jones learns that his father Dr Henry Jones, an expert on Holy Grail lore, has been kidnapped by Nazis who are searching for the Grail. He agrees to go on what he believes to be a harebrained search for the Grail in order to find his father. In Vienna, he is joined by his father’s colleague Dr Elsa Schneider. He rescues his father from the Nazis and together they travel to Berlin and follow a trail of clues on to a lost city in Mesopotamia, racing The Nazis to be the first to obtain the Holy Grail. This was the third of the Indiana Jones films, following Raiders of the Lost Ark (1981) and Indiana Jones and the Temple of Doom (1984). Steven Spielberg, George Lucas and Harrison Ford all return but by now an ennui has set into the series. Rather than treading any new territory, the plot is played safe by fairly much copying Raiders of the Lost Ark over again. All we have is Raiders rehashed with the Holy Grail substituted for the Ark of the Covenant. Furthermore, there is also a race to obtain the artifact against Nazi villains and a Middle Eastern setting, as well as a climax that has the lead villain getting his head melted (this time in a ludicrously hokey Beetlejuice (1988)-styled jack-in-the-box effect). Indiana Jones and the Last Crusade also brings back two of the supporting characters from Raiders of the Lost Ark played by Denholm Elliott and John Rhys-Davies. The action sequences that Steven Spielberg directs are perfunctorily spectacular. The best is one with Harrison Ford being dragged along by and fighting around the outside of a tank. Also good is a sequence with combatants fighting in a wooden speedboat as it is chewed up by the giant prop of a ship. Spielberg aims for an eye-popping sensationalism, staging massive Nazi rallies, sending exploding speedboats skidding across the water at high-speed, impaling trucks on tank turrets. However, bigger is not necessarily more enervating and, along with some optical work that is uncharacteristically shoddy for Industrial Light and Magic, only serves to expose the merely proficient calculatedness at the heart of the exercise. Despite the insistent emphasis on the spectacular elsewhere, the climactic venture into the temple in Mesopotamia seems flat. Steven Spielberg is not a comedy director – when he tries comedy it comes out as overinflated slapstick. There is an awful slapstick sequence where a Messerschmidt goes skidding down a road tunnel with its wings creamed off and the pilot waving to drivers that recalls the numbing excess of Spielberg’s 1941 (1979) disaster. Or where Sean Connery uses his umbrella to stir up a flock of gulls and down another oncoming plane. 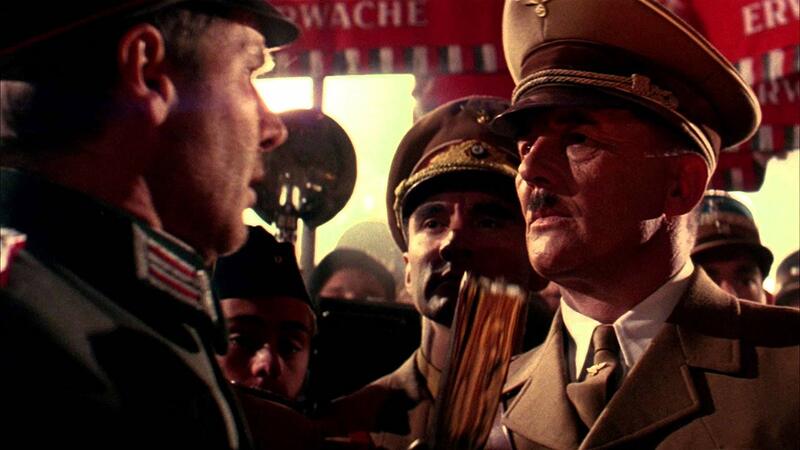 Even Adolf Hitler is the subject of an elaborately staged slapstick gag, which, one feels, is, along with the buffoonish German characters the film presents, a sad undermining of the real evil that Nazism represented. (The contrast between the Nazis here and the ones in Steven Spielberg’s Schindler’s List (1993) is at mind-bogglingly opposite poles of the spectrum). Alison Doody’s heroine is also bland, lacking in the feistiness of a Karen Allen. Even Kate Capshaw’s screaming blonde in Indiana Jones and the Temple of Doom had more life than Doody does here. All is not quite lost. Harrison Ford is back with infectiously lopsided smirk in place and is amusingly paired with Sean Connery in a rare comedy role as his bumbling father. (Although considering the actual age difference between the two actors, Sean Connery’s character would have had to have fathered Indiana when he was twelve years old). The crusty sparring between the two is this entry’s most inspired touch. The film is at its best when trying to give a resonance to the series mythology – such as the extended opening teaser with River Phoenix as the young Indiana that shows how he found the fedora and the bullwhip. Over the next two decades, there were numerous plans for an Indiana Jones 4, which went through numerous script rewrites and rejections before emerging as Indiana Jones and the Kingdom of the Crystal Skull (2008). 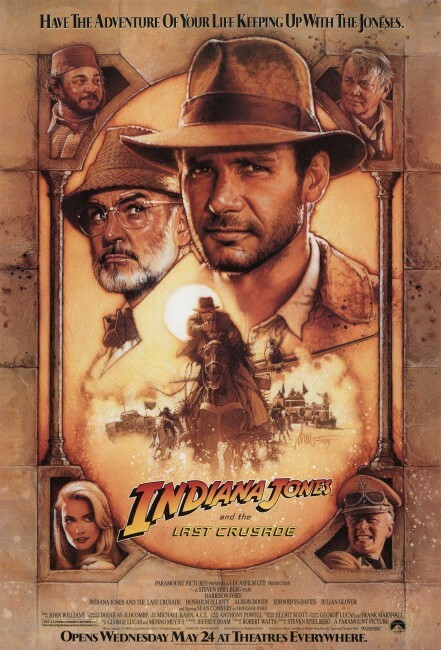 Following Indiana Jones and the Last Crusade, George Lucas spun the character out into a tv series The Young Indiana Jones Chronicles (1992-3). In the tv series, Indiana Jones was played by three people – Sean Patrick Flanery in his teens, Corey Carrier in his pre-teens and by George Hall as a cranky old man framing each story in the present day. In each episode, Indiana would implausibly encounter some 20th Century historical figure. The tv series’ focus also differed markedly from the film series where the emphasis was no longer on adventure but on presenting a pseudo-educational historical forum.